(DAWN.com) – In spite of an agreement between Islamabad and Ashgabat on the price of gas, the future of the Turkmenistan-Afghanistan-Pakistan-India (TAPI) project remains as uncertain as ever. The construction of the pipeline was to commence next year and the project was scheduled to come online by 2016. The implementation is most likely to be delayed further due to the poor security situation in Afghanistan. The Gas Pipeline Framework Agreement signed by the four participating countries in 2008 had originally envisaged the work to begin in 2010 and the supply of gas to commence by 2015. The delay is severely felt since the TAPI pipeline has enormous economic significance for the participating countries; it will link them through what is now called the ‘new silk route’. It will provide Turkmenistan revenues and a way to diversify its gas export routes, and offer Pakistan and India a new energy resource to overcome their power shortages. Afghanistan will get a handsome transit fee and a much-needed opportunity to set up industries along the route of the pipeline. Further, the plan is expected to deepen regional integration and economic and political cooperation, thus contributing to stability. The western powers, especially the US have been backing the project since the early 1990s because, according to geopolitics analysts, the completion of the project will isolate Iran and reduce Russian influence in Central Asia. 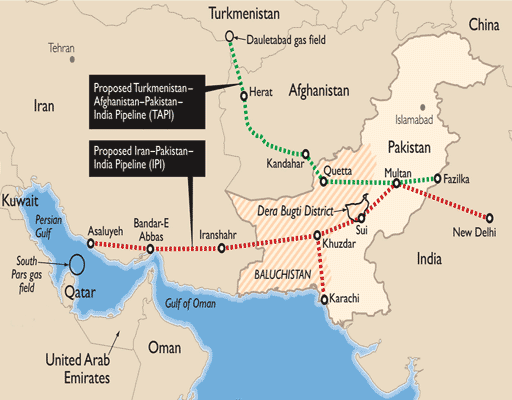 The US has already convinced India to get out of the proposed Iran-Pakistan-India (IPI) gas pipeline project to the disappointment of both Islamabad and Tehran. Its geopolitical and economic significance notwithstanding, the implementation of the project will continue to depend upon peace in war-torn Afghanistan. Even though the segments of the pipeline passing through Afghanistan will be buried in the ground, it is naive to expect anyone to invest money in the project as long as its route remains insecure due to the Taliban insurgency and the influence of warlords. Pakistan should stick to the project but without abandoning its plans to purchase gas from Tehran.